Preoperative T staging of colon cancer, in particular, for distinguishing T3 from T2 and T4, has been a challenge. The aim of this study was to evaluate newly developed criteria for preoperative T staging of colorectal cancer using computed tomography colonography (CTC) with multiplanar reconstruction (MPR), based on the spatial relationship of tumors and “bordering vessels,” that is, marginal vessels that are detectable by multi-detector row CT with MPR. 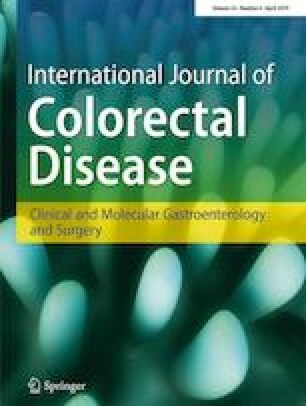 A total of 172 patients with colon and upper rectal cancer who underwent preoperative CTC and surgery between August 2011 and September 2013 were included. Preoperative T staging using the new criteria was performed prospectively and compared with pathologic results. Sensitivity, specificity, and accuracy of T staging by CTC using the new criteria were 63%, 80%, and 77% for T2 (n = 30); 72%, 94%, and 81% for T3 (n = 95); and 79%, 99%, and 97% for T4a (n = 14), respectively. Positive predictive value for T3 was 93%, indicating that a T3 diagnosis by CTC is precise. In addition, negative predictive value for pathological T4a was 98%, indicating that a “not T4a” diagnosis by CTC is also precise. Our newly developed criteria are useful for preoperative T staging, particularly for distinguishing T3 from T2 and T4. The authors thank the former staff of our division, Moriya M., Akasu T., Fujita S., Yamamoto S, and Ochiai H. The authors also thank all of their colleagues and nurses who took care of the patients.